Tarantinoid...the machinations are all familiar enough that your unoccupied brain may drift off to wonder how Hartnett's made a career out of bad haircuts. 110 min. The Weinstein Company. Director: Paul McGuigan. Cast: Josh Hartnett, Bruce Willis, Lucy Liu, Morgan Freeman, Ben Kingsley. Lucky Number Slevin screenwriter Jason Smilovic warns the audience up front with a speech about the "Kansas City Shuffle—when everybody looks right, and you go left." Except movie audiences are all looking straight ahead, and they'll immediately peg Paul McGuigan's new film as Elmore Leonard-lite, a Tarantinoid concoction set not in the real world, but the world of movies. Vacuous Josh Hartnett plays Slevin, a hapless young man mistaken for his friend Nick. Since Nick owes money to the crime syndicate of The Boss (Morgan Freeman), Slevin winds up obliged to pay off the debt in hit-man work. Meanwhile, rival boss The Rabbi (Sir Ben Kingsley, and credited as such, dammit!) picks up Nick and threatens to kill him if he doesn't flip. Bruce Willis plays a shadowy advisor to the crime lords, Lucy Liu plays Slevin's flighty new girlfriend Lindsay, and Danny Aiello has a fleeting cameo as a shylock with a capital "s" who bellows, "Can you pay these monies?" Preceding an flirtateous argument about the best actor to play the part, Lindsay tells Slevin, "You remind me of James Bond." Slevin replies, "That is the nicest thing anybody's ever said to me." One suspects that's because gangster-slacker Slevin never existed before he walked in the door, and indeed none of these characters remotely resemble real people. 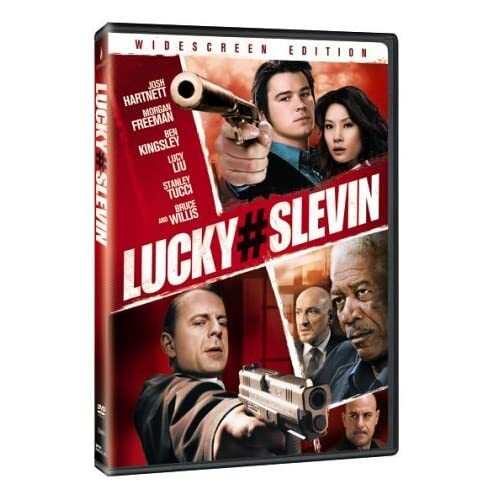 But if self-conscious cleverness doesn't grate on you, Lucky Number Slevin can be amusing. Just be forewarned not to try to make too much sense out of the late-breaking plot twist, one that's incidentally telegraphed at the beginning of the picture. This smug comedy-with-guns has some pleasant banter (who wouldn't be tickled to hear Freeman monologue about The Schmoo? ), but the machinations are all familiar enough that your unoccupied brain may drift off to wonder how Hartnett's made a career out of bad haircuts. 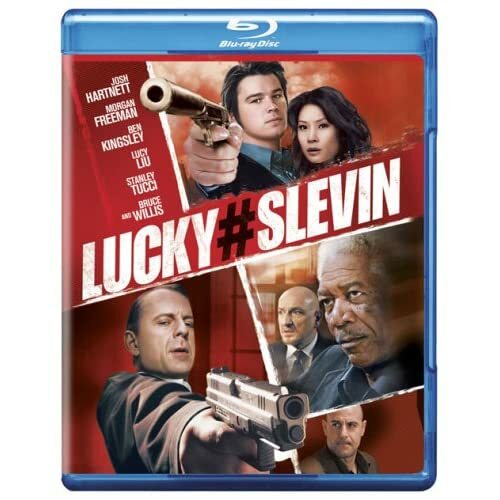 Genius Products' Blu-ray release of Lucky Number Slevin does right by a midrange movie and its small cult of true believers, offering an excellent transfer and a number of bonus features. The image gives a beautiful upgrade to its standard-def DVD counterpart, which emblematically struggles with the film's signature wallpaper. The Blu-ray has no such problems, crisply and accurately rendering the film's many details. The film has never sounded better on home video, either, thanks to a precisely mixed Dolby TrueHD 5.1 surround track. Two feature commentaries are included: one with director Paul McGuigan and another with Josh hartnett, Lucy Liu and writer Jason Smilovic. The soft-spoken McGuigan, like most directors, is game to talk through the salient points of his work, in concept and execution. It's an interesting track for anyone looking for more insight into the movie and its creation. Even more insight into the plot is provided by the film's writer on the second track, though Smilovic is recorded separately and inserted into the gaps of a previously recorded Hartnett/Liu commentary. "Making Lucky Number Slevin" (13:19, HD) is an above-average short-form making-of, with a generous helping of B-roll footage and freely offered comments from Morgan Freeman, Hartnett, producer Tyler Mitchell, Smilovic, Bruce Willis, McGuigan, Liu, and Ben Kingsley. A Blu-ray exclusive, "An Intimate Conversation with Josh Hartnett & Lucy Liu" (14:27, HD) intersperses clips with the titular interview, a casual chat recorded in a mixing studio. These are always a bit more theatrically interesting than the pre-packaged interview clips so often the stuff of video extras, and Hartnett and Liu banter effectively while also sharing some insights about the work of an actor and the work of Lucky Number Slevin, a project that they report evolved significantly from script to screen. "Deleted Scenes" (20:32 with "Play All" option, HD) with optional commentary by McGuigan are an added treat; we also get the "Theatrical Trailer" (2:05).